Between 1992 and 2005, I published five books with Addison-Wesley. When I started writing what became Effective Modern C++ (EMC++), I assumed I'd publish with them again. That didn't happen. Instead, I worked with O'Reilly. Several people have asked about my change in publishers. In this post, I offer background information for my decision to change. The decision itself will be part of a later post. This post is about publishing, not C++. Unless you're interested in some of the business aspects of publishing, I suggest moving on to xkcd now. The post is long. You might want to sit down. Manuscript creation is the writing of the book, including diagrams, tables, code examples, etc. It also includes having draft manuscripts reviewed for comprehensibility and technical accuracy. Production transforms a manuscript into products for consumption by book-buying customers. It includes typesetting, page layout, and cover design, as well as the generation of files suitable for printing or for delivery to end users, e.g., PDF, HTML, epub, and mobi (for Kindle). Production also includes having physical books printed. Distribution takes print books and digital book files and makes them accessible to prospective customers. That primarily means getting them into bookstores (both physical and virtual, both domestic and international), but it also includes arranging for translations into foreign languages. Marketing works to bring the book to the attention of prospective customers and to get them to take a look at it. Glossy brochures, promotional web sites, social media activities, organization of author appearances, etc.--that's all marketing stuff. So is the distribution of sample copies of the book to "big mouths:" reviewers, bloggers, high-profile community personalities, and other "thought leaders." In a traditional author-publisher relationship, authors are primarily responsible for creating a manuscript, and publishers focus on production, distribution, and marketing. In reality, who does what is fuzzier. Publishers usually provide developmental editors as well as copyediting, artwork, and indexing services that help authors produce good manuscripts, and authors typically assist publishers in the creation of marketing materials that will appeal to the book's target audience. It's also assumed that authors will engage in their own promotional activities to complement those performed by the publisher. For my print books with AW, I took care of both manuscript creation and production (my deliverables were print-ready PDFs), and I wrote almost all the copy used for marketing. For EMC++, I wanted to produce a book that looked good in both print and digital form, but I knew from people who'd been there that creating digital books that work well on multiple devices is a nontrivial undertaking. I therefore decided to let my publisher handle production. For a publisher, taking on a book involves financial risk. It costs money to create a book, but there's no guarantee that the book will sell well enough to cover the expenses. One of the things publishers do is fork out the money needed to go from manuscript to book. But how big a fork are we talking about? During my work on EMC++, I looked into self-publishing, and I spoke fairly extensively with a freelance firm with experience producing and distributing programming books. They ultimately quoted me a price of $25K to take my manuscript and create files for print-ready PDF, directly-distributable PDF, device-independent epub, and device-independent mobi. That fee also included getting the book into physical and online bookstores. Let's assume a publisher would incur roughly the same costs for production and distribution. We'll also assume that this would also cover the cost of preparing files for Safari Books Online, something that the freelance firm I talked to didn't do, but which I consider to be an important outlet for reaching corporate customers. Those quotes were for a book with a two-color interior. That's the format for Effective STL and the current edition of Effective C++, and it was my plan for EMC++. O'Reilly decided to print EMC++ with a full-color interior, which makes the print book look much nicer, but also increases their per-unit printing cost. I don't know how their costs compare to the ones I was quoted. I didn't look into the costs associated with marketing, but it's fair to say they're greater than zero. I'll pick a number out of a hat and say $5000 covers a publisher's cost to get marketing copy written, web sites implemented, press releases created, tweets generated, big mouths' egos stroked, etc. The advance pushes the the publisher's up-front cost to $47.5K, which I'll round up to $50K, because I'm sure there are expenses I'm overlooking. Note that I'm not considering costs publishers incur after a book has been released, such as handling returns and tracking and issuing royalties. I'm looking only at the financial situation as of the day the first books are made available to the buying public. Now, a one-color book would cost less than the two-color book in my scenario, but a longer book would cost more, and there are a lot of books with more than about 300 pages. For the kind of back-of-the-envelope analysis of this blog post, I'm going to go with $50K as the total up-front cost to take a manuscript and bring the resulting book to market. My books generally list for about $50, so let's assume our theoretical new book lists for the same amount. For books purchased from the publisher at full price, that's also the publisher's revenue, but very few books are purchased at list price. O'Reilly routinely offers coupons for 40% off, and AW is currently running a sale on some of my books offering 50% off if you buy more than one title that's part of the promotion. When the publisher sells a book to a retailer (e.g., Amazon, your local technical bookstore, etc. ), the retailer pays the wholesale price, not the retail price. My understanding is that the discount off list to wholesalers is comparable to sale prices offered to end-customers who buy from the publisher directly, so let's assume the wholesale price of the book is 40% below list. That is, let's assume that for a book with a list price of $50, the publisher actually gets an average of about $30, regardless of whether they sell directly to individual programmers or they sell to corporate juggernauts like Amazon. Those numbers are for the print version of a book. The list prices for digital versions are typically lower. For example, the digital version of EMC++ lists for about 15% less than the print version, and the list price for the digital Effective C++ is 20% below that for the print book. Furthermore, the discounts offered off list price for digital purchases are often larger than for print books. O'Reilly often runs sales on digital titles at 50% off list, for example, in contrast to the 40% off they usually offer for print books. If we assume that our print book with a $50 list price has a digital list price of $41.25 (17.5% lower than print--halfway between how AW and O'Reilly treat Effective C++ and EMC++, respectively) and that digital sales typically take place at 45% off list (as opposed to 40% for print books), the publisher's revenue on digital sales is $22.69 per book. Let's call it $23. A $50K up-front investment and an average revenue of $27.50 per book means that the break-even point for the publisher is 1819 books. Well, it would be if authors would work for their advances only. Most don't, and that brings us to royalty rates. O'Reilly used to put their standard contract online (they don't seem to do that any longer), and in that contract, the default royalty rate was 10% of the gross revenue they got from sale of the book. In the example we've been discussing, that'd be 10% of $27.50/book. With such a royalty rate, the publisher's take would drop to $24.75/book, the break-even sales number would increase to 2021 books, and we'd find we need a term to describe the per-book revenue a publisher gets after royalty costs are taken into account. I'll call it ARC ("After Royalty Costs") revenue . When I first signed with AW in 1991, the default royalty rate was 15% (I have no idea what it is now), and with that kind of author royalty, our theoretical publisher's ARC revenue drops to $23.38/book. The break-even point rises to 2140 books. But let's dream big. A 50-50 revenue split--a 50% royalty rate!--would drop the publisher's ARC revenue to $13.75, thus pushing the break-even sales number to 3637 books. If it's true that most programming books sell no more than 5000 copies, that implies that the chances of the book making money for the publisher are comparatively small, especially when you recall that I'm considering only costs that are incurred up to the point where the book is initially released. Also note that the break-even point includes no profit, and publishers generally take a dim view of projects unlikely to make money. We conclude (or at least I do) that for a "typical" technical book published under the conditions I've describe above, the royalty rate must be below 50% for the project to make financial sense for the publisher. We pay 50% royalties for our books. ... We take what we receive for a book, subtract direct costs (printing, copy edit, artwork if any, that sort of thing) and split it with you. From an author's point of view, this is exciting, but note that before "the Prags" pay 50%, they subtract costs associated with the production of the book, including printing, copy editing, etc. That is, some of the $50K in up-front costs that technical publishers traditionally absorb as well as the cost of printing the book itself--something else publishers traditionally absorb--gets subtracted before the 50% royalty is calculated. There's nothing wrong or underhanded about that, but it's important to recognize that what The Pragmatic Bookshelf means by a 50% royalty rate is different from what a publisher like AW or O'Reilly would mean. If you want to keep more of the money that comes from selling your book (or if you simply don't want to cede control over production, distribution, and marketing), you need to take on more of the tasks that publishers traditionally handle. In essence, you need to be the publisher, and we live in a world where self-publication is easier than it's ever been. If you publish using Amazon's Kindle Direct Publishing, for example, you reach the entire world in one fell swoop. The royalty jumps to 70%, too, which looks pretty darned attractive. At least it does at first glance. Of the three tasks that publishers traditionally tend to, however, Amazon addresses only distribution, and it addresses it only partially. The only digital formats it covers are PDF and mobi, and it covers them only for the specific files you provide. That means no epub, no Safari Books Online, no foreign translation, and of course no print books. Taking 30% of the revenue for such a limited service seems kind of pricey to me, though in fairness Amazon also covers the rather critical job of taking customers' money and giving you your share. Amazon also distributes book updates to people who've bought your book (e.g., to correct errata), which I consider an important service. But look more closely at the 70% royalty rate. First, it's not available worldwide. For example, it's available in the USA, England, Germany, Japan, and several other countries, but not in China, Russia, Norway, or Sweden (among others). For details, consult this page. Perhaps more importantly, it applies only to books priced between $2.99 and $9.99. Where the 70% rate doesn't apply, the royalty drops to 35%. That means that a book priced between $10 and $20 yields a lower per-book royalty than one priced at $9.99! It's clear that Amazon wants books for Kindle priced below ten bucks, which is good for book buyers and good for Amazon's market share, but whether it's good for technical book authors is a different question. If you succumb to Amazon's arm-twisting and charge $9.99 for your book, you get a $7/book royalty. If it took you 1500 hours to write, produce, and market the book (i.e., about 150 hours--more or less a full-time month--beyond what it took me to write EMC++), you need to sell over 3200 digital copies to have earned $15/hour (a number that is beginning to gain some traction as the new minimum wage in the USA). In view of the conventional wisdom that most programming books sell no more than 5000 copies and my experience that book buyers tend to prefer their book in paper form, that 70% royalty rate doesn't look as enticing as it originally did. Another option is to bypass Amazon entirely, assuming the burden of distributing and selling your book directly. This lets you keep 100% of the proceeds from sales, though you then incur the cost of the online transactions (e.g., fees for credit card processing) as well as the rewards, such as they are, of customer service. But it puts you in the driver's seat of every aspect of your book's publication. That's the approach Bruce Eckel and Diane Marsh took for Atomic Scala. However, I really wanted a traditional publisher. I didn't want to deal with production, distribution, or marketing, nor did I want to find people to subcontract those pieces to and have to manage them. Furthermore, the authors I know who've done the self-publishing thing still generally skip some distribution channels that I consider important, e.g., Safari Books Online or foreign translations. Working with a traditional publisher lets me focus on what I want to do (produce a manuscript), secure in the knowledge that it's somebody else's job to address the aspects of book publication that have to be done, but that I don't want to spend time on. Distribution: Get the book into online as well as brick-and-mortar bookstores, both in the United States and internationally, ideally in both print and digital form. Get the book into Safari Books Online. Arrange for the book to be translated into foreign languages. Push book updates for customers of digital versions out to those customers when updates are made available. Marketing: Get the word about the book out in ways that I can't or that would not occur to me. I have no interest in marketing and, probably not coincidentally, I'm not any good at it, but I recognize that just because a book gets published doesn't mean anybody pays attention to it. 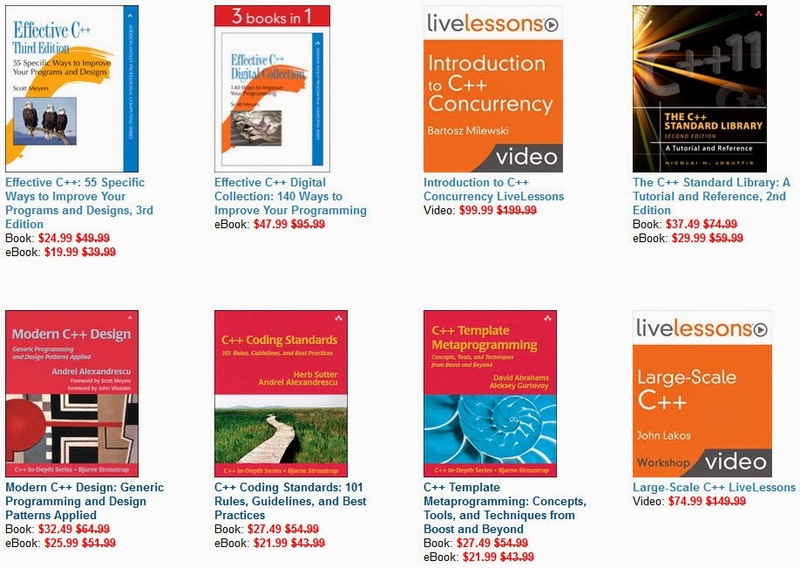 Those wacky marketing gurus at Addison Wesley are at it again, offering a variety of "Effective Programming" books at 40% off -- 50% off if you buy two or more. Two of my books--Effective C++ (both print and digital) and the digital collection of all my Addison-Wesley C++ books--are part of the promotion, but the sale includes C++ books and videos by others, including Andrei Alexandrescu, Herb Sutter, Nicolai Josuttis, John Lakos, and Bartosz Milewski. The promotion isn't limited to C++. You'll also find books and videos on Java, Python, Ruby, and C#, including several from my Effective Software Development Series. If you're a programmer, you're sure to find something you can use. To initiate your shopping spree, click here, and don't forget to use the discount code EPSALE at checkout. No, I don't get a kickback (other than my usual book royalties). The promotion runs until May 18.